The Semper Continuity Suite exists of four components in the back office side. These components can be installed on separate servers or combined on one server, dependent on the size and load of your infrastructure. The four components are installed separately shown in the installation in the menu as separate items. This component requires a Microsoft SQL server database to store its data into. For smaller environments a SQL Express edition is included, but a pre-installed SQL server can also be used. The component requires several supporting software components like MSI Installer 4.5, Microsoft .Net Framework, Microsoft SQL native client and Microsoft SQL Server 2005 Command Line Query Utility. The supporting software is available within the installation and will be installed automatically if the software is not available on the server. The installation of this component is pretty straight forward. First the question to use the included SQL 2005 Express or an already installed SQL server needs to be answered. Next the system will be checked for the required supporting software and if not available it will be installed automatically. Actually the installation only installs SQL (if selected) and creates the necessary database within it. The second component validates the licenses of the product via the Semper Software website. This installation is also pretty straight forward by accepting the license agreement and specifying the destination location. Just like the database component the server will be checked for the required components and if not available they will be installed automatically. This is the same supporting software as the database server but includes the SQL Report Viewer. After the installation of the software you need to specify the database server containing the Semper Continuity Suite database because this could be a separate machine. 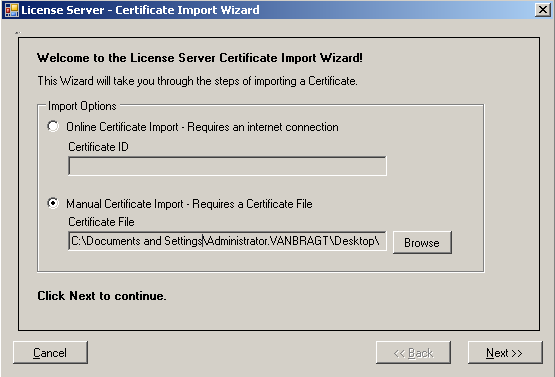 The last step is to specify the location of the license cert file (or request one online), so the product is licensed for usage. The Boot Server stores the images (more on this part later in the review), serves the PXE boot services and uses the PXE OS to send and receive images. During the installation the normal questions are asked like accepting the license agreement and the destination location. Additionally the location of the repository data files (image store location) should be specified, the credentials for the boot server login must be filled in, the license server IP address needs to be provided and the location of the database server needs to be selected before the files are installed on the system. The software also requires Internet Explorer 7, which is installed automatically if required. The Enterprise Manager is the combination of management tools to configure and manage the Semper Continuity Suite infrastructure. This component can be run from the server but would normally be installed on administrator PCs. The installation also requires specifying the license server and the database if the product is installed on a separate server or PC otherwise the already configured database connection created during the Boot Server installation will be used. This component requires Microsoft SQL Native Client, MS SQL 2005 Command Line Query Utility and again Microsoft Internet Explorer 7. All of which are installed automatically if they are required. Not a component of the Semper Continuity Suite is a DHCP server, but this is a requirement for the product to function. For example Microsoft's DHCP implementation can be used. Remarkable is that none of the installation steps requires a reboot. The first time you start the management console you should assign the license to the product and you need to setup administrators. It's a pity that there is no option to connect Active Directory/Users for larger infrastructures. Each administrator must be created in the Management Console. Users can have different roles within the suite so delegation of control is possible. The roles available are Administrator, Create Profiles, Create Departments, Create Users, Client Allocation, Active Directory View and Feature Allocation. It will become clear during the review what these access rights will do, when the features are discussed later on. After the installation it's time to setup the environment. The first step in this process is to create an image that can be rolled out to the other clients. The same steps need to be performed like any other product that uses imaging techniques. So you build up a machine with the desired operating system, configuration settings and optional applications you would like to include into the image. The source machine should be configured in its BIOS that the PXE network boot order is the first option in the boot order list. The machine should then be booted up so that it starts the PXE boot option. The machine will then connect to the Semper Continuity Suite and will be added as client in the software. The client can be found in the unallocated folder and with the right mouse menu the option can be selected to create an image of this client. You need to specify a name for the image, the partition(s) that should be imaged and you can provide a status to the image and a comment for it. 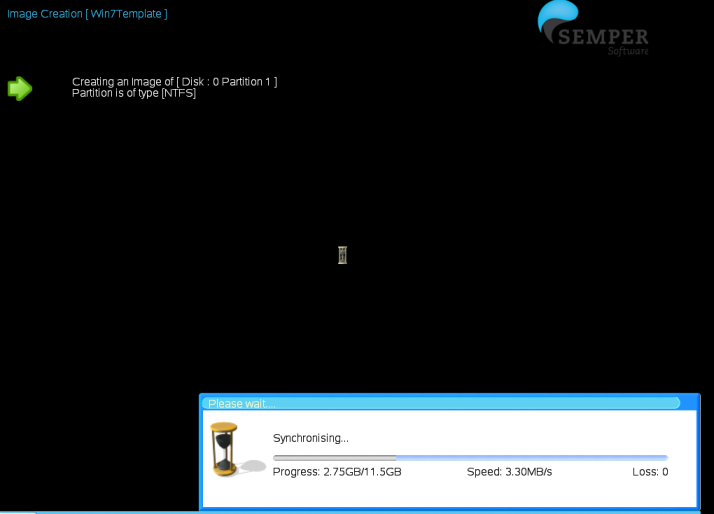 The initial image will take some time because all the data will be synchronized from the client to the repository. However additional image takes will be much faster because Semper Software have built-in a feature that files will be re-used in the repository if they are already available. This will save both disk space and time as it speeds up the imaging process when taking more images. Once an image is available the next step is to create a so called Deployment Profile. 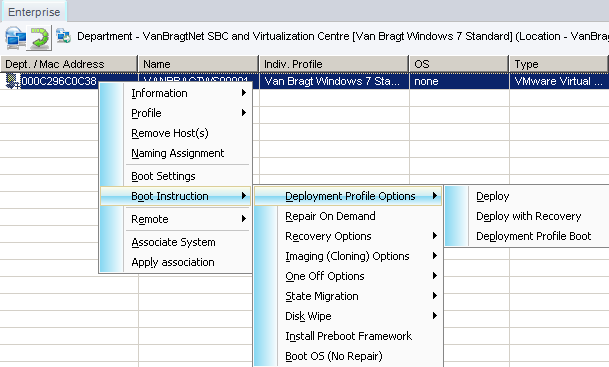 Within a Deployment profile it can be specified how the client should be deployed (such as naming rules, domain membership, partition layout), but also the type of repair mode. This repair mode is the technique that makes the Semper Continuity Suite unique in the deployment market. The Continuity Suite can revert a client to a previous state, without formatting or erasing the drive. After the initial deployment the suite can create snapshots. These snapshots make it possible to revert the client to a previous state after, for example, a Windows file gets corrupted; a user accidently removes an important file, or even to the level that a software product is removed from the system. This step is performed quickly because the suite creates a local cache, which is synchronized with the central repository on every client during deployment. This cache contains all the information that is necessary to start-up the process. Semper Software has mentioned that a full revert takes about 5 to 10 minutes. It's even possible to do such steps in an offline mode (without a network connection), which is a big advantage because this makes it possible that laptop users can repair their own clients independently wherever they are located at that moment. The product has several repair modes, dependent of the requirements of the infrastructure. In this mode the product automatically repairs altered files back to those that are known by the suite. With this scenario new files that are added without knowledge of the suite will not be removed or reverted to a previous state. Only known files that have been altered will be reverted, so if the users installs a new application this will not be monitored by the product. The automatic repair will be done at every start of the client and will take about 45 seconds as a baseline, depending on the size of the image, hardware specifications and the amount of files that should be replaced. This mode is useful in default workstation infrastructures, where the Semper Continuity Suite takes care of the Operating System. If applications need to be added, a new repair snapshot can be made at a later point. This new repair snapshot will then serve as the basis for ongoing repairs. To ensure no data is incorporated into the snapshot it is best created after the system has been repaired, thus removing data before the creation process. With Automatic Replace the client will be completely rebuild at every start of the client. Every start of the client assures that the machine is back in a clean state without any changes made by the user before the start-up. Again because of the local cache the process can be done in around 5 to 10 minutes. This scenario is useful for Schools, Universities, and Internet Kiosks, but also for virtualization techniques like Terminal Servers (both Microsoft RDS as Citrix XenApp) and VDI implementations that don't have such techniques available to them. In this mode the product is just being used like other deployment products; by arranging the partitioning, formatting and initial installation of the client. 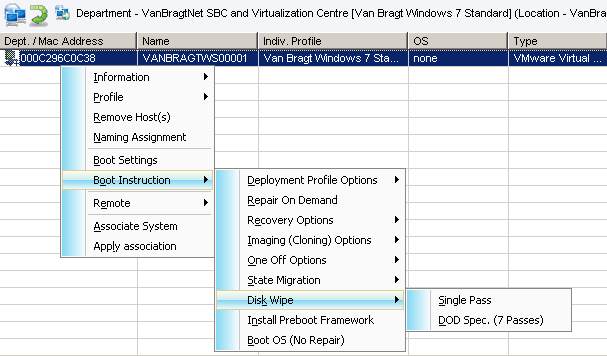 After the deployment is done without a snapshot no repair options are available. It will take up from between 5 to 10 minutes when the image is in the local cache to 10 to 20 minutes when the files are not yet available locally and must be retrieved across the network from the repository. This option can be useful for school setups or training rooms where different operating systems need to be quickly rolled out, for example, between two different lessons. The Repair on Demand type differs from the previous types in that the trigger to do the repair does not happen automatically on boot-up, but by manual interaction. With Repair on Demand, one of the administrators of the product will select the type of repair mode from the Management Console. Normally this will occur if a user created a support call mentioning that there are problems on his client. Beside the earlier mentioned options of Automatic Repair and Automatic Replace there are also options to Ignore Document and Settings (same process as Repair All with the exclusion of the Document And Settings folder in the process) and Fast Return (a faster equivalent of Always Replace, because no formatting is performed and system files are replaced ). This mode is not available for offline usage, because the process is started out the console so the machine needs to be available (online) during boot-up to "pick-up" the command given by the administrator. In many organizations this could be the default setting for normal clients, and then only specific clients will receive any of the other repair modes. The Recovery Console offers the same functionality as the Repair on Demand mode, but the trigger is initiated by the end-user from the client. Logically more profiles can be created for specific situations. For example the Repair on Demand for normal desktops, then Automatic Repair for the Kiosk machines and the XenApp servers, while the laptops can be configured with the Automatic Repair function. 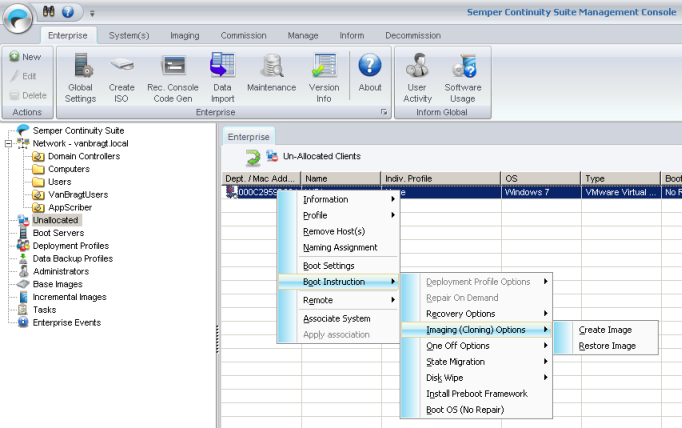 In the Deployment Profile the image needs to be specified so that apart from the repair option the image is also part of the configuration. The creation of a Deployment Profile starts with providing a name for the profile and assigning a base image to the profile. You can also assign an incremental base image. These will be explained later on in this review. Next is naming convention where two options are available: keep current name or configure a naming convention where the last two digits of the last octet of the IP boot address will be added together with elements from the internal folders (discussed later). In my opinion this is a bit limited. In the Repair Options, inside the Deployment Profile, the desired repair mode can be selected and if used on a laptop, or any other computer that is not always connected to the network, the ‘stand alone' mode can be selected, which enables offline repair activities. You can also change or add partitions, force specific protocol settings, preconfigure a screen resolution and set some other general settings. When the machine needs to join the domain the settings, like the username and password for adding the computer to the domain, can be specified within the domain component. The last setting adds the possibility of adding a Data Backup Profile, which will be described later. After specifying at least one profile, a configuration should be made in the Locations and Departments component. This component will group clients in a logical group. To this logical group a profile can be assigned. When a new client is added to the network and started-up using PXE, that client is added to the Unallocated group. The client should then be moved by an administrator to a defined group in the Locations and Department folders and then the profile will be applied to that client. It would be a good idea if these folders had any kind of integration with Active Directory. If you don't read the essentials guide then you will probably lost as to what you should do after the profile creation, because it's not clear where the profile can be assigned to something. A location is created out of the right mouse button menu when the top Semper Continuity Suite component out of the left tree is chosen. In this menu there is the option for New Location. In this location you need to specify a location name and a manager (one of the administrator accounts earlier created). You can configure a prefix; this value will be added before the machine name as specified in the profile. Also the asset audit settings can be configured (also later more about this topic). On the authentication tab you can configure the authentication type that is used when you log in before Windows on the client. 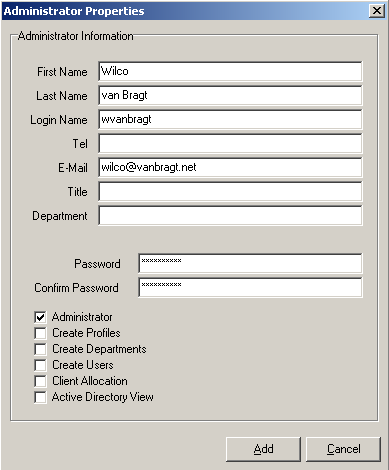 Here you can use the accounts configured in the suite, but also Active Directory or Radius is supported. On the third and last tab you can configure the default screen size and the default keyboard layout for the pre-Windows OS. Within a location at least one department should be added. To this department component the Profile can be assigned. Also a unique name, a manager and again an optional prefix can be added. Although the whole mechanism is based on locations and departments, and it may seem that many organizations are not using such a structure to manage their workstations anymore; but these Locations and Departments can be named anything at all to suit the organization. Examples are geography, organizational hierarchy, or simple collections of machine types. After creating the location and devices structure, applying a Deployment Profile to it, and moving target machines into it, you are ready to deploy the first machines. You need to boot the target client using PXE so the client is known in the suite. The system will be appear in the unallocted container. If the profile is configured with the ‘Keep current name' option you should configure the client to have an existing name, otherwise it will be named for its MAC address. When more machines are added you can use a naming convention right-click tool to configure the name for the whole set. When a later machine is added you should use the same naming convention, but you should look up what the last number deployed was. This could be in several places within the location and department folders. When the machine has a machine name or when you using the auto-naming convention within the profile, you just need to drag and drop the client from unallocated to the Department folder. (You can skip this step by applying a profile to the individual client within the unallocated component, but then you don't have the administrative overview that using the Locations and Departments folders gives you.) Next select the client and again use the right mouse button to open a menu and select the following available option: Boot Instruction - Deployment Profile Options - Deploy. Then the machine should be restarted and the deployment will start automatically. This can also be done directly from the context based ribbon buttons at the top of the console. Logically, like any normal installation you should give the machine some time to do the installation. The Semper Continuity Suite has also the ability to perform some post installation tasks. For example it can install applications. According to Semper Software this is nice add-on for smaller companies, but not devoloped for enterprise customers. They advise the use of pre-existing products for such tasks. Logically I tried the repair mode during the review by deleting files while also adding some data files then using the repair all mode and it worked like a charm. However showing the process is a bit difficult without a video. In this video http://www.youtube.com/user/SemperSoftware by Semper Software you can see how the process works and that the software is replaced back on the client. When everything is stored locally in the cache the process is pretty quick. 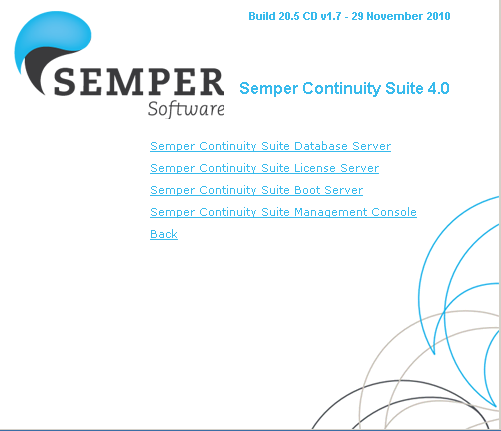 In addition to the basic process described above, the Semper Continuity Suite offers several additional features worth mentioning in this review. First I will start with Incremental Images which have already shown up during the Profile creation. I have already mentioned that the store only saves the same file once, so adding several images of the same operating system won't cause the consumption of lots of addition disk space by the second and following images. However maintaining lots of images is also not advisable. The Semper Continuity Suite introduced this feature to reduce the amount of base images while making better use of them by optionalising the software packages one can layer on top after deployment. After creating the image you can redeploy it and install additional components. These changes are added to an Incremental Image that can be assigned in a profile. For example you can create one Windows 7 base images and two incrementals one with Office 2007 and the other with Office 2010. Another really powerful feature is called ‘Decommission'. This feature is available from both the Management console and via the pre-Windows console on the client. A ‘Disk Wipe' can be performed in the case the client is at its end of life. The product has two types of Disk Wipe available: a single Disk Wipe and a seven pass Disk Wipe. The last one is in conformity with the US Department of Defense specifications. Also included in the product is the automatic audit of the hardware and available software on the clients that PXE boot. The information of this inventory can be shown at three levels: the individual machines, on department level and on the level of the whole suite including all defined locations. The inventory is performed during the PXE boot. On the hardware at the individual machine level the following information is available: System, Processor, DMI, Disk PCI and Memory. At department level DMI, Disk and Memory are available. The software scan is performed via the registry and also includes Microsoft license keys if they are available. The product also supports the User State Migration utility by Microsoft directly out of the Management Console. The User State Migration Tool can be used to migrate user settings from one operating system (for example Windows XP) to another (for example Windows 7), so the user does not need to reconfigure his application settings again while he is migrated to a new Operating System. The product also supports a kind of Recovery Image technique just like a hypervisor can do. This causes an image to be taken prior to deployment. This options is useful if you use the product on servers, which you have deployed with the ‘deployment only repair mode' so that when you apply an update of the sofware running on the physical machine it is perfect that you can take an image, so in case the update fails you don't need to install the whole server again. The vision behind the product is unique and as far as I know so is the product in the market. Indeed in the datacenter everything is achieved to keep downtime to a minimum while on the client side normally nothing special is done. Of course you can think that if all workstations are fully managed it's easy to replace one, but even if everything is in place it will take at least an hour to deploy a workstation again. In real life I'm sure that many companies still have workstations that are not the same and this product guarantees that the workstation is available for the end user in just a couple of minutes in case something goes wrong. So in organizations where every second lost costs a lot of money, and a Fat Client solution is being used, the product can be pretty useful. Next to traditional deployment the product can be used to add the snapshot functionality to physical machines and it can be for RDS Session Hosts and Citrix XenApp servers an alternative for OS Streaming products which rely fully on the network, where alternately this suite relies on the local cache in Automatic Replace mode. I expected a difficult installation and setup of the product, but actually it's pretty easy process. Of course there are some improvements to made, mainly based on the administration level. Examples are the administrators creating in the suite on personal level only without AD integration. Also the naming convention options could be improved. There are several options available in the suite which I don't see a real market for (like the floppy image creation option) and it's a bit difficult to find out what each option is actually doing even after reading the full administration guide. Unique product with a different vision for companies where running and working client are essential. Product can be used for different models (workstation repair, RDS/XenApp implementations, Snapshot for physical servers, offline laptops). Hardware and Software inventory functionality within the product. Some features are not fully enterprise ready like the naming convention options and the Locations and Department folders not being AD integrated. A couple of features are in my opinion are really specific features, which are not created for a large audience. The product could me more tightly integrated to Directory Services. Wilco van Bragt is an independent consultant and author based in the Netherlands. He is the owner of the Server Based Computing and Virtualization website called VanBragt.Net Virtualization, where he is publishing several articles related to Terminal Services and Virtualization topics and product reviews. Besides Wilco van Bragt presents on several independent conferences and also writes articles for several other websites. Wilco van Bragt is self employed (VanBragt.Net Consultancy) providing consultancy services in the Netherlands and Belgium. Wilco van Bragt is a MVP on Terminal Server, a RES Valuable Professional and a Citrix Technology Professional. Semper Software, the proven leader in Windows and Linux software continuity, is driving a transformation in the way organizations reduce the cost of managing and deploying their PC and server populations. The company's cutting edge technology empowers its customers, from SMBs to global enterprises, to manage what has become an increasingly complex PC and Server ecosystem, meeting all the requirements that are essential to software continuity, providing availability in excess of 99.9% and playing a crucial part in an overall business continuity strategy. Designed for servers, desktops and laptops, Semper Software's award winning technology enables IT professionals to automatically recover PCs and servers from virtually any state back to a working state within minutes, without wiping any user data.